Family for desperate for answers after loved ones vanished in Mexico. HOUSTON, Texas (KTRK) -- Two Texas lawmakers are involved in the efforts to find a Houston family missing in Mexico. As Eyewitness News first reported last week, Maria and Juan Vargas and their 18-year-old son, Daniel, disappeared while they were on their way home to Houston from Mexico in January. They had traveled there for a funeral. Somewhere outside Tampico, south of Matamoros, they went missing. The couple's daughter is desperate for answers. "We're still hoping one day they'll come back. We hope and pray. The unknown is the hardest part," said Annel Ochoa, who is married with two children. January 5 was the last time anyone spoke to the family. They were traveling in a 2014 Chevrolet Malibu. Mexican authorities have distributed missing persons fliers. Ochoa says she has talked to agencies, politicians and federal police on both sides of the border and can't get any answers. A family is desperate for answers after their loved ones vanished during a trip to Mexico. "We recently bridged the gap between the FBI and the Mexican Consulate of Houston so they are now working together," Joseph Puente, Communications Director for US Congressman Gene Green (D-TX), told Eyewitness News Wednesday. "We are trying to help her (Ms. Ochoa) as much as we can." 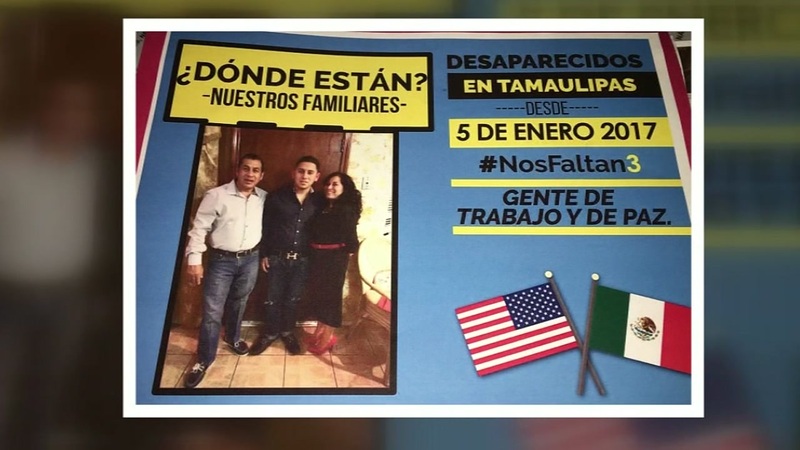 State Representative Armando Walle sent a letter to the governor of Tamaulipas, Mexico writing he fears the family may have been kidnapped. He also pleaded for the governor's help. "Don't give up," said Ryan Fenley, whose friend, Mark Kilroy, was kidnapped and murdered 30 years ago in Matamoros. What happened to Kilroy drew worldwide attention. His killing was part of a human sacrifice ritual. Fenley encourages Ochoa to be persistent. That's the only way, he said, she'll get answers. "You have to keep it in the spotlight," he said. Ochoa said her family are all U.S. citizens. Her father owns a body shop in Houston where her brother also works. Her mother has a job. They all live in the Greenspoint area. Ochoa believes they may have been kidnapped, but no one has contacted them for ransom and Ochoa says they have a modest lifestyle. They are appealing for help to bring them home alive. "I'm praying everyday. I'm very hopeful they are (alive), and I just need answers," Ochoa added.